Tatyancha Dhaba is a new eatery on Aundh-Baner link road, specialising in super-sized Maharashtrian thalis. This dhaba is where you'll find authentic regional fare in the form of 4 meat-centric (2 mutton, 2 chicken) family-style sharing thalis. The Sarpanch thali is the largest one on the menu, serving approx. 15 kgs of mutton in the form of mutton kheema, kaleja, gravies like kala rassa, tambada rassa, aalni rassa, and other dry mutton fry preparations. A slightly smaller version is the Patil thali, which is served with two kinds of mutton fry (red and kala), vazadi masala fry, and the rassas. The Karbhari thali (made with broiler chicken) comes with khara chicken fry, kala chicken fry, tambda chicken fry, as well as tambda and kala rassas, and accompaniments. Its counterpart is the Savkar thali - which features the same dishes, only cooked with country chicken. 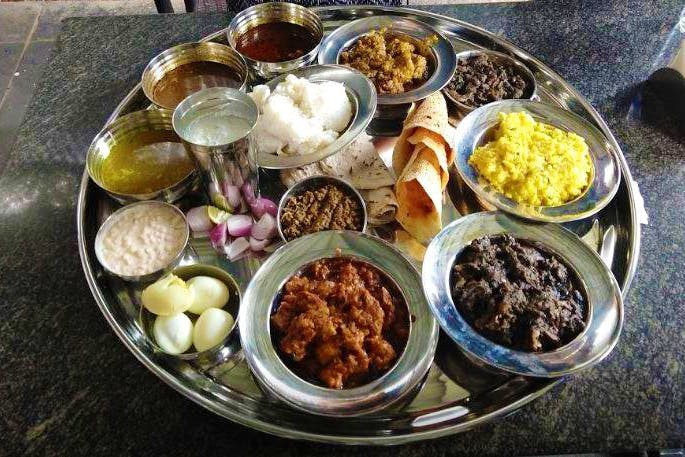 Aalni pani, Indrayani bhaat, aalni bhaat, boiled eggs, papad, boondi raita, chapatis, jowar bhakris, bajarichi bhakri, gavan (a brown rice dosa) and taak are the accompaniments served with the meat and gravies. One thali can be shared among 4-6 adults, depending on the size of their appetite. The thali portions are not unlimited, so extras are chargeable. Priced between INR 2200 (mutton) and INR 1200 (chicken) it's still value-for-money when you share. The wait time for a table can be as long as 40 minutes - which is annoying, especially if you're hungry. People have also complained that the wait staff are slow and sometimes rude - which we hope is an issue that Tatyancha Dhaba will tackle through proper training. We recommend you try and get there at least 15 minutes before their opening times.